You probably know a thing or two about creating good content. Perhaps you dabble on your own blog or write for your company. There’s a good chance you’re already creating more content in 2015 than you did in 2014. That’s the challenge. We’re all content creators trying to reach an audience. To stand out from the crowd, we need to be more interesting, interactive, and data-driven with our content. We need to give users a unique experience. One solution that is becoming more prevalent is interactive content marketing. Interactive content marketing (I’ve also found it called “marketing apps”) is not a groundbreaking new format. It is just a category of content marketing that is currently taking shape, and brands are just beginning to experiment with it. Think of a survey tool or an interactive infographic. Interactive content is any user experience (commonly a web-based tool or microsite) that has an interactive element and allows the user to participate in the content and find out some useful answers or results. The best examples of interactive content marketing solve problems first and are content marketing campaigns second. If you are developing interactive content, it’s best to gauge success by total shares or average session time instead of click-through rate. Just keep in mind that it’s not about you, and it’s not about direct lead generation. It’s about providing value to an audience. Good interactive content marketing doesn’t use pop-up solicitations, aggressive CTAs, or underhanded sales pitches. My agency recently developed a tool to help people decide whether a template or custom website was the right choice based on 18 factors (Try out the tool). We avoided the tempatation to over-brand or add a sales-driven call to action. We wanted to stay neutral and provide value. What we’ve seen is an average session time of over 19 minutes, and the tool is being shared beyond our expectations. We’re not hiding the fact that we made it—we’re just not making it about us. Simple used their data to create interactive maps of restaurant tipping in the US. Who Will Lead the Interactive Content Marketing Charge? Building interactive content is an expensive alternative to traditional blogging, whitepapers, or even full content hubs. Not all brands are built to be publishers, and most brands are not equipped to easily build interactive content. Not only will brands need to come up with winning ideas and create the written content, but interactive content requires design and development expertise. It’s hard enough to keep a consistent flow of good, relevant, optimized content, let alone building interactive experiences. Expect nimble digitally-savvy brands and agencies to be innovative with branded web experiences and interactive microsites in the coming years. Brands and agencies with in house creative, design, UI, UX and development, and the willingness to invest more time and resources into content marketing will stand out and reap the benefits of their experiments. Brands that are comfortable building for the user and not getting blinded by lead generation tactics will succeed with interactive content marketing. These same brands are already succeeding with content marketing in general and are building their companies and products around the customer and providing value without expectation. As the content marketing surge continues, new and creative ways of reaching an audience will be required. Users will expect something special, not just an opinion and a well-written article. 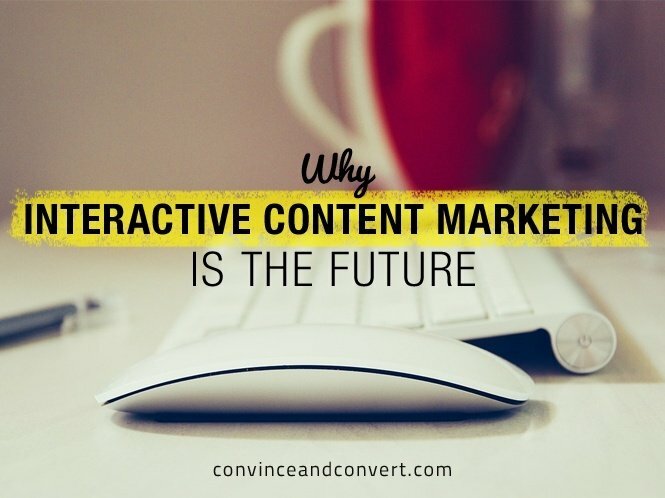 Interactive content marketing is one way brands are taking their content to the next level. Expect to see plenty more of it in the years to come.